Alright, so you have finally been named the Child Pharaoh and are ready to begin your, hopefully, long reign over the great sands of Ancient Egypt. Of course, what is better than being King than being a God-King!? Especially as a little kiddo!? Well, one major advantage is that your grand guardians will still probably make sure that you’ve got all of your important royal regalia ready for you before you move out to address all of your beloved followers! Headdress, check. Gold-lined robe? Check! Did you remember the serpent cane, enchanted by the mighty deity Ra… who is kind of yourself? Yessir! 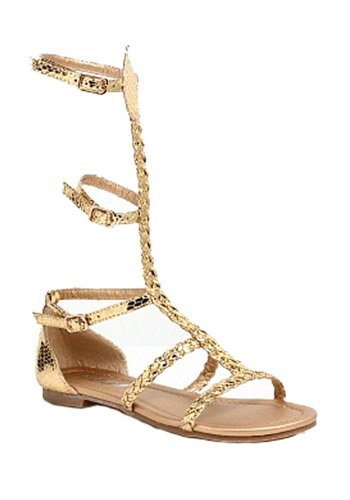 But… did you remember your gold-braided sandals? Mmm. Well, good thing that we’re looking out for you. With these Child Egyptian Gold Sandals, you can be sure that you are looking royally rad but also leave enough free foot space for you to curl your toes in the sand and maybe get the quick kiss from some of your servants.